Although Sagres is on the Algarve it doesn't have the same over-developed holiday town feel of some of those towns further east. Situated within a few Km of Europe's most south western point, Cape St. Vincent, the town has a rather windswept, remote feel about it. The town itself is pleasant enough in places, with an attractive square, but there is little of historical or architectural interest as the original town bore the full brunt of the 1755 earthquake. It comprises of a lively, working harbour, a clutch of bars and restaurants around the square, a small supermarket and perhaps most importantly to many of its visitors a fine beach. Not surprisingly the town's restaurants have a reputation for serving a wide variety of fresh fish. It is however the history, location and surrounding features that make Sagres well worth a visit. In terms of global importance, Sagres' heyday was in the 15th century an this was down to Prince Henry the Navigator. He chose Sagres as his home and location of his school of navigation. The school boasts alumni such as Fernao de Magalhaes (Magellan), Pedro Alvares Cabral and Vasco da Gama whose impact on the World is still felt today. It was from nearby Belixe that the first caravels were launched, the same ships that brought about Portugal's age of The Discoveries and helped define the nation's identity. 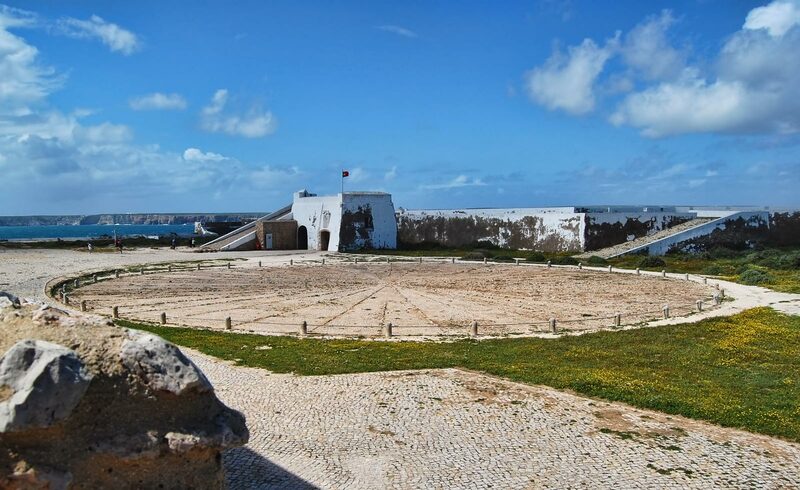 Henry's most obvious legacy to present day Sagres is the Henry the Navigator's Fortaleza located on the imposing headland of Ponta de Sagres to the north of the town. The hulking walls of the 17th century fort only remain on one side with the impressive enterance arch the only access. Beyond the walls, things are moderately less impressive with the small restored 15th century chapel of Nossa Senhora da Graça and the Rosa dos Ventos, a pebble wind compass measuring 43 metres across. The compass was discovered in 1921 up until when it had been buried below a church. 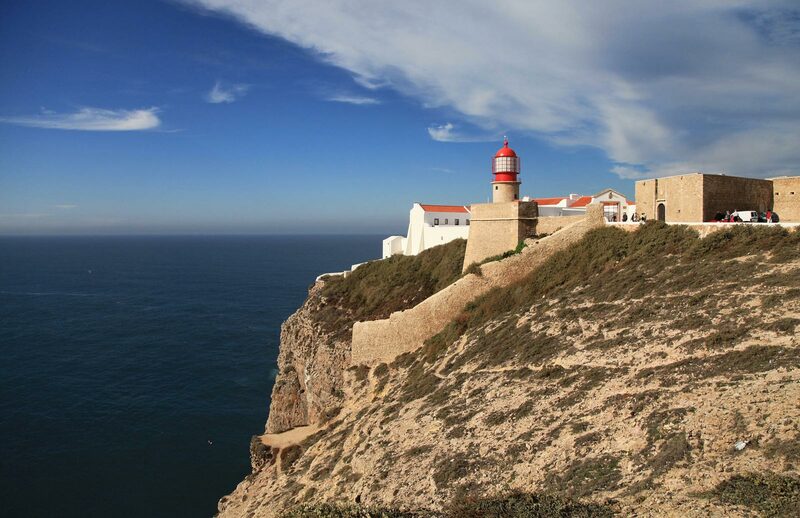 From the tip of Ponta de Sagres there are great views up the coast to Cabo Sao Vicente (Cape St. Vincent), Europe's most south-westerly point. The cape derives its name from the martyr St Vincente whose relics were allegedly carried to the cape from the Holy Lands by ravens. Here they guarded them until in 1173 they carried them to Lisbon where they still remain. The cape's history as a sacred place actually dates back to Neolithic times to which the existence of several menhirs attest. Today the cape is better known for its lighthouse. Built over the ruins of a sixteenth-century Franciscan convent in 1846 to guard one of the world's busiest shipping lanes, it is the second most powerful in Europe. Its two 1000-watt lamps can be seen up to 60 kilometers away. 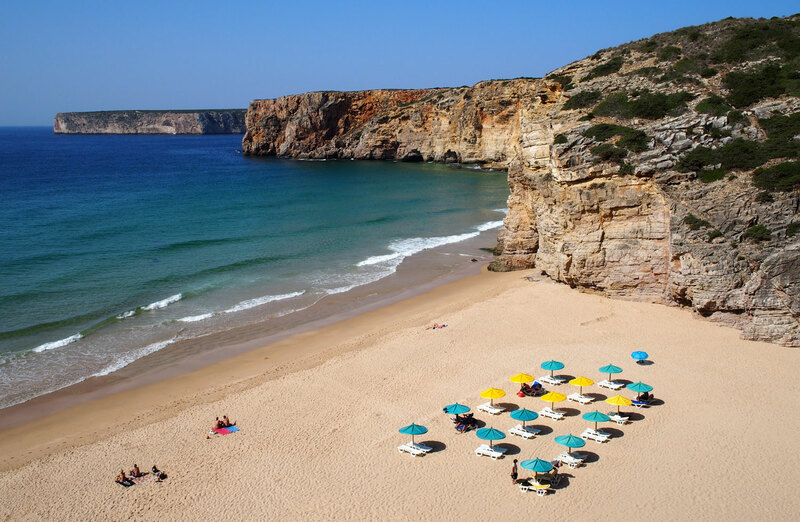 Sagres is better known these days for its fine beaches, popular with both sunbathers and surfers. In fact the shape of the coast here means you can find a sheltered beach, and/or good surf most of the year. Praia da Mareta is the town's main beach is a 600 metre long beach 5 minutes from the centre of town. It is on the more sheltered southern side of the point and made up of sand and pebbles. It has easy parking and is a popular family beach. Praia de Beliche, a small, sheltered beach just to the north of the town. Praia da Baleeira is a small beach situated on the eastern side of the harbour. Mostly sandy, there can be occasional problems with the water quality due to its proximity to the harbour. 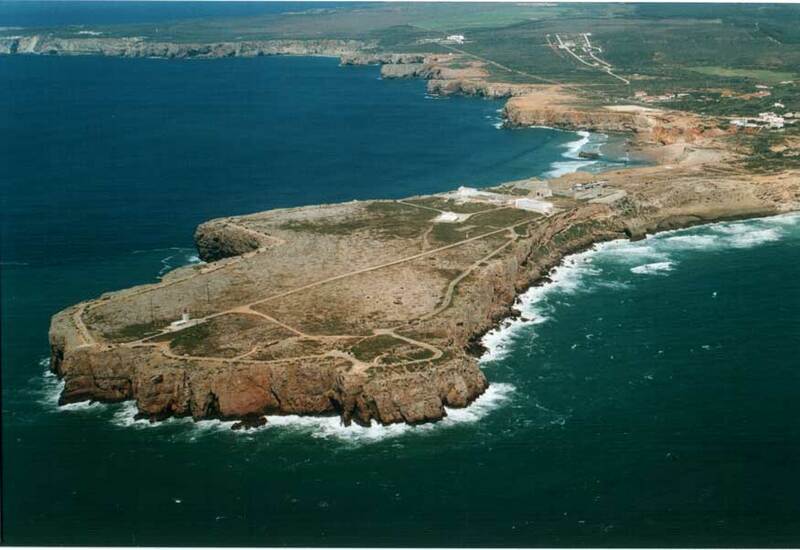 Praia do Tonel is located on the exposed northern side of Sagres point. This often makes it a poular choice for surfers. It is a good sized sandy beach and is patrolled by lifeguards in the summer. Praia do Martinhal is just outside Sagres to the east. It is a fine sandy beach surrounded by dunes. Being less central than the other beaches means it can be quieter.